I have quiet an extensive database on the Struve family which begins with Johannes Strauve, who was born about 1510 in Cramme, near Wolfenbuttel, Germany. He married and had a son named Berthold Strauve. Berthold Strauve was born about 1530 and married to Dorothea Wolters. They had two boys that I know of, Johannes and Hennig. Johannes Strube was born about 1550 and married to Katharina Bruggmann. Johannes and Katharina had 3 children; Andreas, Appolonie, and Berthold. Berthold Struve was born on February 4, 1587/88 in the Cramme Marcha area of Brunswick. He died on February 15, 1649/50 at Magdeburg in Germany. In 1617 at Schleusingen he married Anna Margaretha Brunner, who was born on September 26, 1598/99 at Schleusingen, and she died on August 24, 1669 at Magdeburg. Berthold and Anna had 7 children. Georg Adam Struve was born September 27, 1619 at Wanzleben Castle in Magdeburg, Germany and died December 15, 1692 at Jena in Weimar. Georg married 1st to Anna Maria Richter. She was born April 11, 1634 in Jena and died February 12, 1661, also in Jena. Georg and Anna had 9 children. Georg married 2nd to Susanne Berlich. Susanne was born at Jena in 1647 and died January 22, 1698 also Jena. With Susanne, Georg fathered 13 more children. Friedrich Gottlieb Struve was born November 10, 1676 at Jena and died June 22, 1752 at Kiel, Germany. On May 12, 1707 at Jena, he married to Katharina Sophie Zulich, who was born August 4, 1689, Jena and died May 26, 1708, Jena. One son was born to this couple. On November 6, 1709 at Frankenhausen, Friedrich then married to Johanne Dorothea Werner, born January 7th, 1685 in Sondershausen, died June 18, 1742 in Kiel. Johanne and Friedrich had 12 children, including my ancestor. After Johanne died, Friedrich married to Susanne Maria Luders on September 24, 1746 at St. Nikolai, at Kiel. Her birthdate is unknown but she died on February 14, 1774 in Kiel. It is not known whether there were children to this union. Anton Sebastian von Struve was born on April 2, 1729 at Kiel. He died at the Great Fire of Griez on April 7, 1802. Anton married on May 11, 1756 to Sophie Friederike Reimers. She was born in 1735, place unknown, and died May 21, 1795 at Regensburg. Anton and Sophie had 10 children. Johann Christoph Gustav von Struve was born on September 26, 1763 at Regensburg. He died on May 6, 1828 at Karlsruhe. On May 18, 1793 at Plochingen, in Prussia, he married Sibilla Christiane Friederike Hochstetter. "Christiane" was born at Stuttgart on June 28, 1773, and died on May 22, 1842 at Blasiberg near Tubingen. Gustave and Christiane had 10 children. Johann Ludwig Karl Heinrich von Struve was born on August 9, 1812 in Stuttgart and died on March 3, 1898 at Rothenberg, Odenwald. "Heinrich" married to Stephanie Borowska on September 19, 1836. Stephanie was born about 1818 in Silesia, Poland and died in Poland on November 9, 1843. Heinrich and Stephanie had two sons, Amand and Louis (Amand being my ancestor). After Stephanie's death, Heinrich married Wilhelmine Charlotte Margarete von Hochstetter on September 19, 1844. Wilhelmine or "Minna" was born March 13, 1823 in Bern and died August 27, 1903 at Morfelden near Frankfurt am Main. To Heinrich and Minna were born 5 children. The oldest, Stephanie, was born at Chobanin, and the others were born in Texas. Heinrich immigrated to Texas in 1848 with his wife Minna and 3 children; Amand, Louis, and Stephanie. Sometime after Elizabeth, the youngest daughter was born (around 1850) the frontier life became too much for Minna. She moved back to Germany with the four small children. Heinrich remained true to her and was able to see her again in Germany before he died. 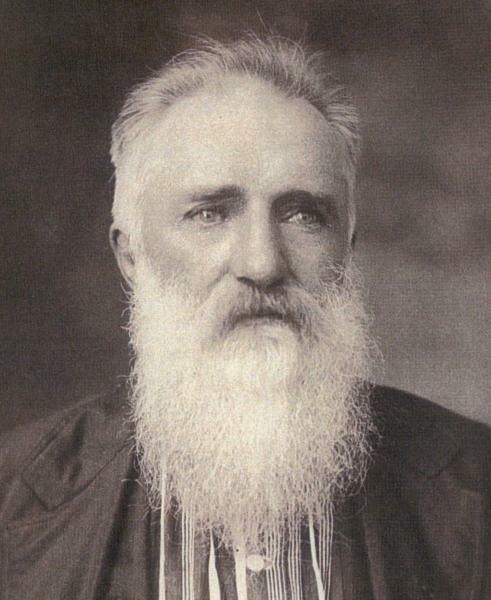 Friedrich Wilhelm "Amand" Struve (pictured here) was born at Froeschen, Silesia, Poland on August 3, 1838 and died July 27, 1902 at Cypress Mill in Blanco County, Texas. On December 25, 1871 at Burnet, in Burnet County, Texas he married Christiana Otilia Fissler. Christiana was born April 29, 1839 in Germany and died on June 14, 1897 at Cypress Mill. Amand and Christiana had 7 children, one of which was my ancestor, Stephan Douglas Struve. After Christiana passed away, Amand married Else Baumann. This was a brief marriage and no children were born to them. Stephan Douglas Struve was born at Shovel Mountain in Burnet County, Texas on May 22, 1876 and died in August of 1958 in Lamb County, Texas. He married Sophie Louis Sammann on May 4, 1909 at Plainview, Hale County, Texas. Sophie was born August 20, 1882 at Brenham, Texas and died in June of 1942 in Lamb County, Texas. Stephan and Sophie had 5 children, one of which is still living. Thelma Wilhelmena Struve was born on July 27, 1915 at Plainview, Hale County, Texas and died on May 18, 1999 in El Paso, El Paso County, Texas. She married James Belton Williams on August 6, 1934 at Littlefield, Lamb County, Texas. "J.B." was born on December 6, 1913 at Bronte, in Coke Co., Texas and died January 14, 1998 at Maxwell, Caldwell Co., Texas. "J.B." and Thelma had 5 children, all of whom are living. I'd like to fill in some of the "earlier" families in the Struve line. I have a lot to share in reference to this family, so please contact me if you need information.